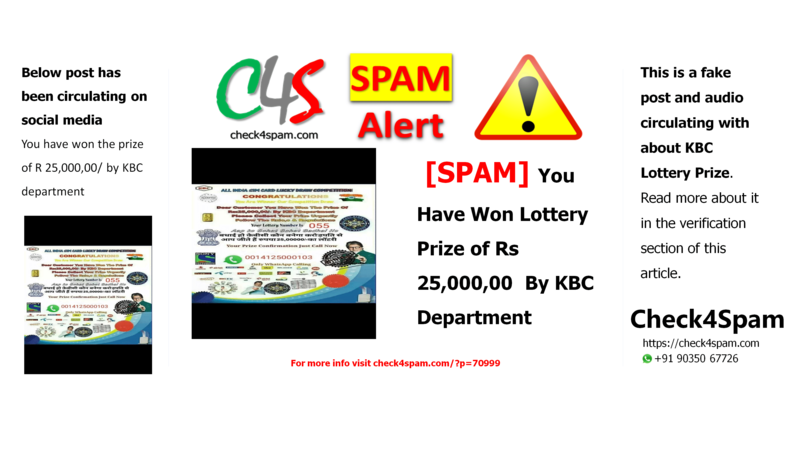 This post claiming that You have won the prize of Rs 25,000,00/ by KBC department, your lottery number is 005, circulating on social media is fake. Please find more details in this article. Below post has been circulating on social media. Verification: This message and audio is not from KBC department. You can very clearly see the number is of someone from Pittsburgh, United States. It’s just the common sense we should use and be curious that why somebody from United States will call and give us prize for the TV show in India.There is no relevance. The audio says about bank manager, State Bank of India. How is that possible.There are many such posts circulating with various lottery numbers, prizes and mobile numbers. These all are fake. Please dont share any details about your bank account or anything with such people. Please do Check4spam before you Share anything on these given numbers. Now check this: This number is from Pakistan. This is another screenshort when i dialed the mentioned number in another such fake post that excites people about winning lottery and make them fool for monetary benefits. The first thing you should do is to check the code and if you have doubt, then inform police immediately. This can save you from getting trapped. Why a person from Pakistan talk about Indian Bank and give lottery money for KBC. Just use common sense and save yourself and others. We ensure that you are updated with the facts. Please Check4spam before forwarding and believing any doubtful image, message or video. Be cautious, be safe. Our WhatsApp Number is +91 90350 67726. Kindly note that it’s NOT a real-time support. Our Team checks WhatsApp requests periodically based on the time bandwidth. As we have heavy traffic on WhatsApp these days we may not be able to immediately respond to your requests. Introducing Nokiye (https://nokiye.com), a search engine powered by Google Custom Search to find Fact Checking Reports/Articles about any topic you are looking for. For example try searching “Air India to be closed on 1st October 2018” at nokiye.com to find all of any fact checking reports/articles about the Air India story. © 2019 - Check4Spam. All Rights Reserved.